Deja Vu Restobar is a Italian, Indian, Chinese restaurant available in Gopalan Innovaiton Mall, Bannerghatta Road. They have good Indian and Italian buffet for those who have got faded up with the South Indian Sambar Dal and Dosa. 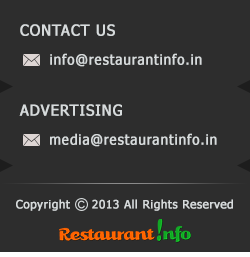 Indian Non Veg restaurant is rare in this area of Bannerghatta Road and BTM Layout, So fans of Indian food and Non Residential of Bangalor can get a fresh smell of Non Veg Food here. The Lunch buffet has been priced Rs.249 and the Dinner buffet will cost Rs.289. They have many offers on serving drinks. You can avail buy1 get 1 free offer on selected drinks. And from Monday to Thursday at lunch you will get 1 mug beer at Rs.60 only. On the ladies night of Thursday they will serve free drinks for the ladies. The best thing I like of this restobar is their decor. yeah! it’s not exotic but calm, clean and specious all these words can describe it’s quality in short.